Tribhuvan University [TU], Institute of Science and Technology, Office of the Dean, Examination Department, Kirtipur has published the Board Examination schedule of B.Sc CSIT Fourth Year 7th Semester Examination Schedule of Batch 2070. The examination will be held on Aashad and Shrawan 2074. The examination start date is 23 Aashad, 2074 [7 July, 2017] and end date is 8 Shrawan, 2074 [23 July, 2017]. Examination Center: To be published later. Find HERE Scanned Original Exam Routine Of B.Sc. CSIT, 7th Semester, Batch 2070 published by TU. See the detailed routine of B.Sc. 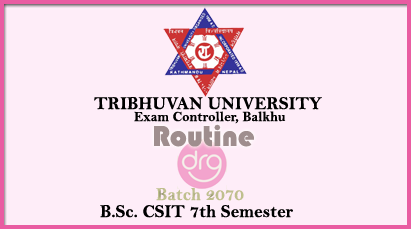 CSIT, 7th Semester, Batch 2070 Published by TU. 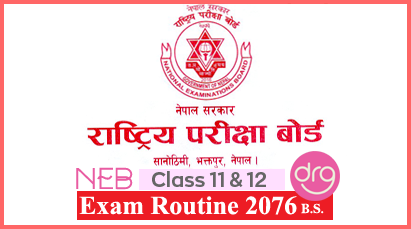 0 Response to "Exam Routine Of B.Sc CSIT | 7th Semester | 4 Year | Batch 2070 | TU"